Suggested Use: Adults: 2 to 6 capsules daily with meals or as directed by your health care professional. Trace Minerals — LifeLink’s formula provides the minerals your body requires in a form that your body can use. Colloidal trace minerals are mixtures of extremely small crystals of various mineral elements or their salts. Particles of this size, if they are water soluble, dissolve easily in the water of the digestive tract and are absorbed. If they not water soluble, they dissolve into the cell membranes they make contact with, enabling them to be absorbed into the body as individual atoms or molecules. If the particles were larger (as they are in many other brands of mineral supplements), they would pass through the digestive tract unabsorbed and wasted. 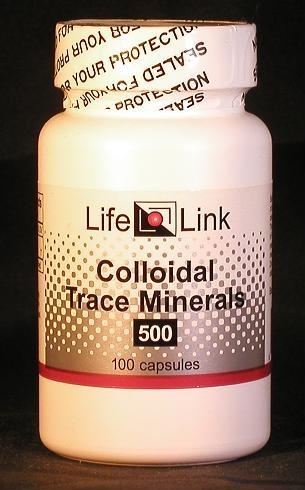 LifeLink’s formula contains dozens of minerals, but is particularly rich in potassium, calcium, magnesium, phosphorus, manganese, copper, chromium, zinc and boron.